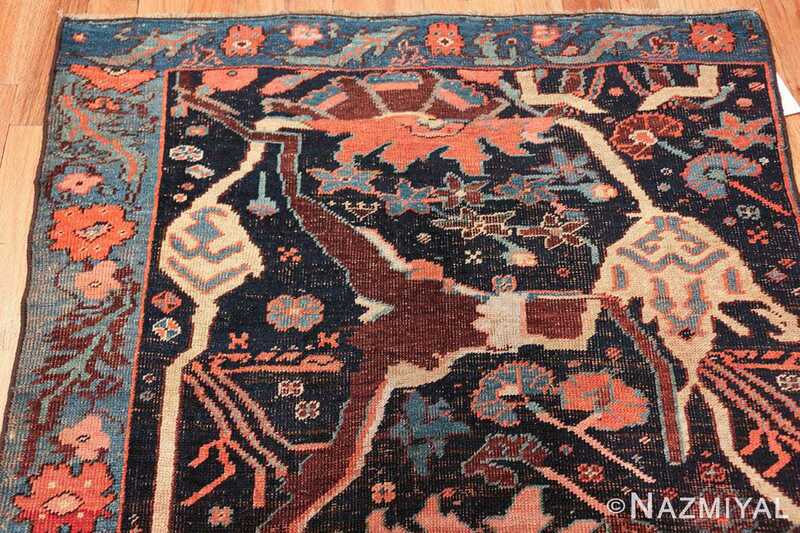 Beautiful Small Size and Highly Collectible Antique Persian Bidjar Sampler Rug, Country of Origin / Rug Type: Persian Rug, Circa Date: 1890 – This gorgeous antique Persian Bidjar rug is magnificent and rare collectible antique sampler / wagireh rug. 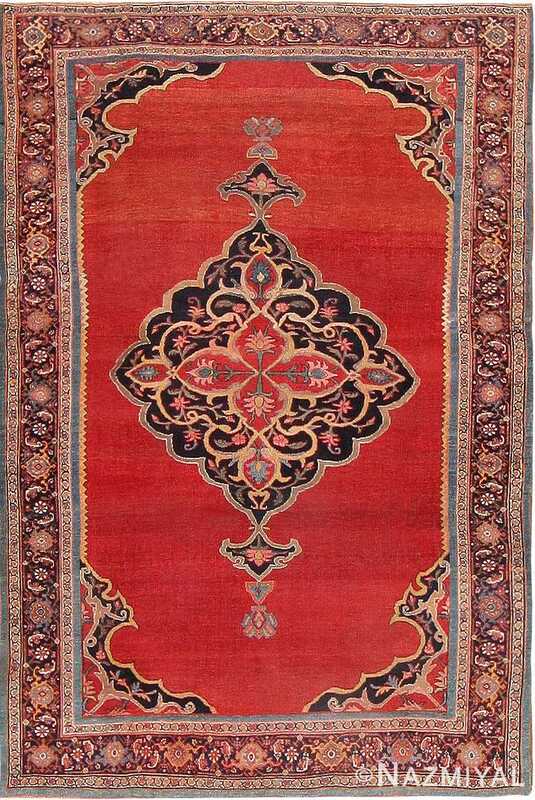 It features an archaic beauty that will add an intensely clandestine charm to any interior design aesthetic. 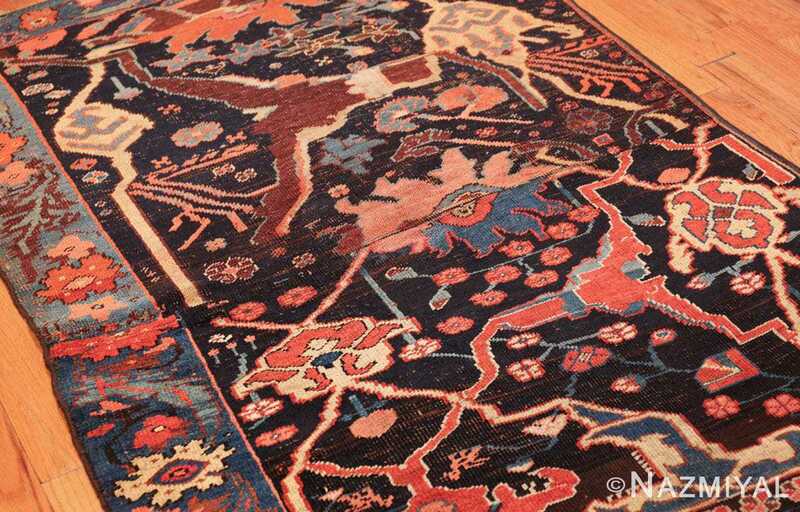 Exciting and rich jewel tone rug colors are rendered on a dark background. 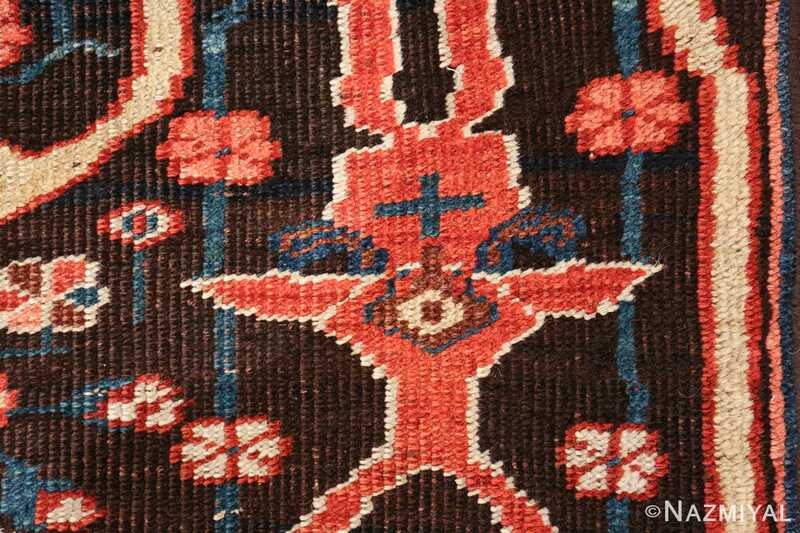 This combination of dark background and lighter colored tribal design elements, create a magnificent juxtaposition. 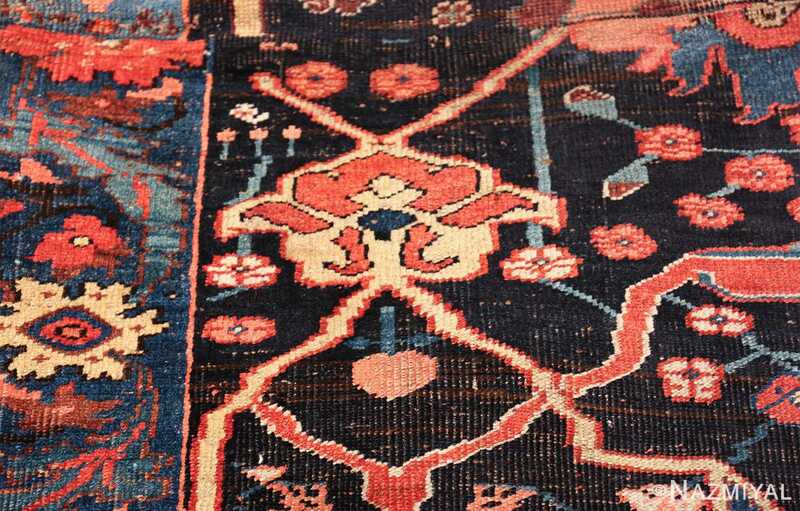 The lighter blue border, featured on two of the four sides of this antique Persian carpet, depicts floral imagery in brilliant and happy color tones. 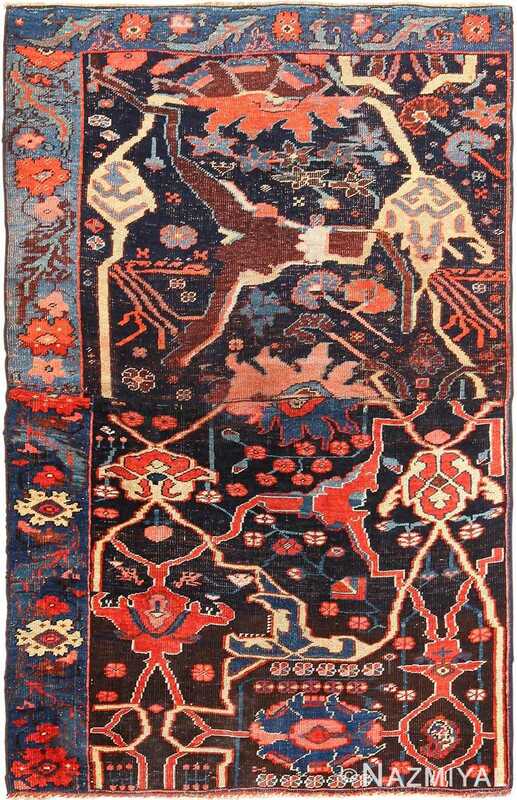 Images of vines scrolls and leaves are woven through this life like scene to create a remarkably organic and idyllic effect. These floral details are depicted in smaller design shapes in the central design of the Persian Bidjar rug. 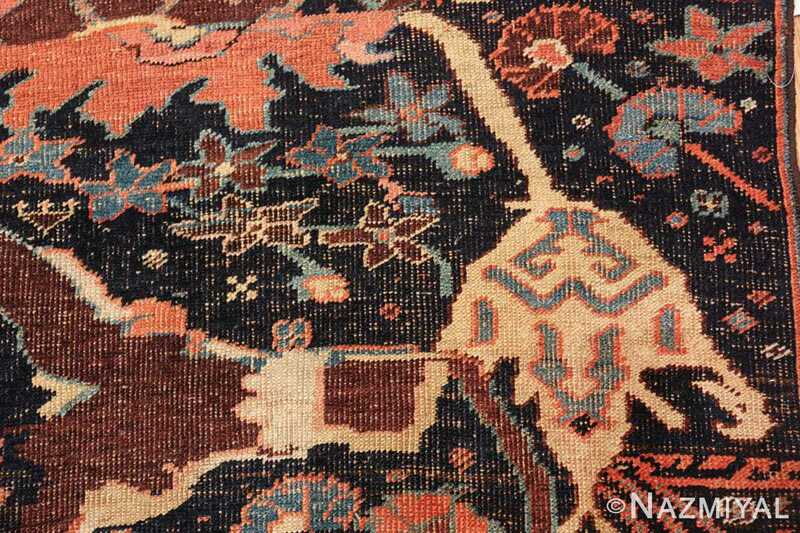 This loosely mirrored affect gives the whole antique Persian Bidjar sampler rug an intriguing fusion of similarity and diversification. 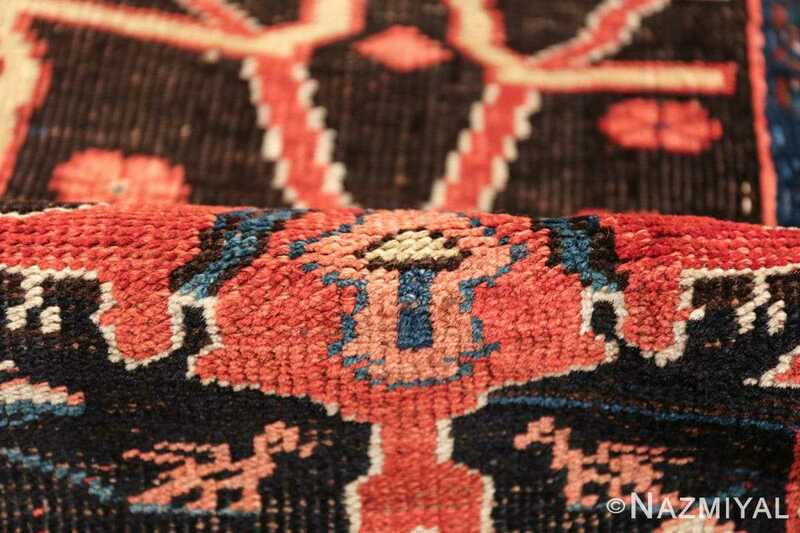 The central field design is a brilliant work of tribal and primitive art. The dark black background contrasts strikingly with the natural and abstract patterns, which are rendered with brilliant mastery and skill. 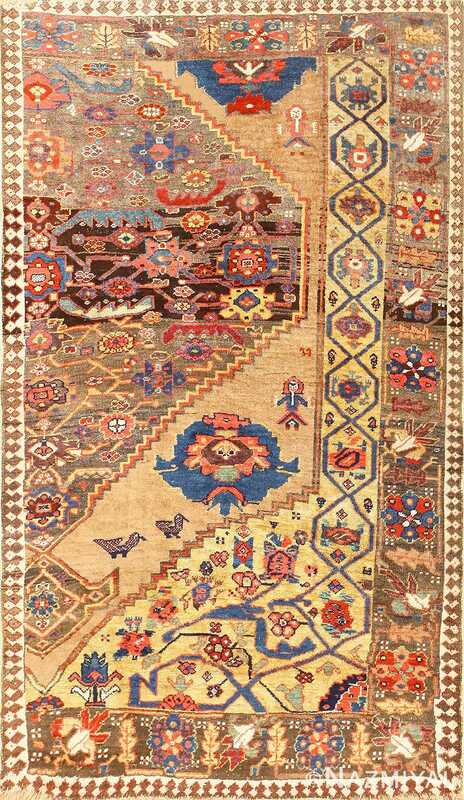 A thread in the color of pale sand is woven throughout this rich and riveting scene to add unity and cohesion to the illustration, but there is just enough variety in the rest of the design to allure the eye of the observer and create a curious fascination. 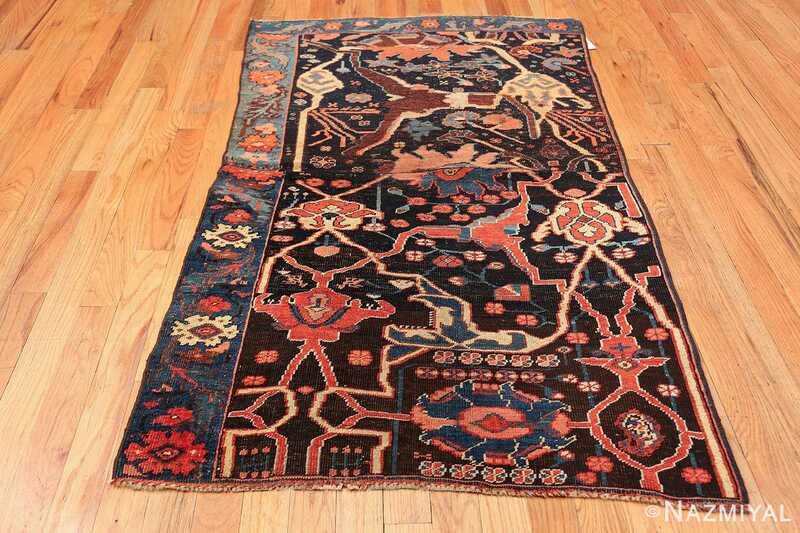 The majestic power of this beautiful piece is sure to outlast the years. 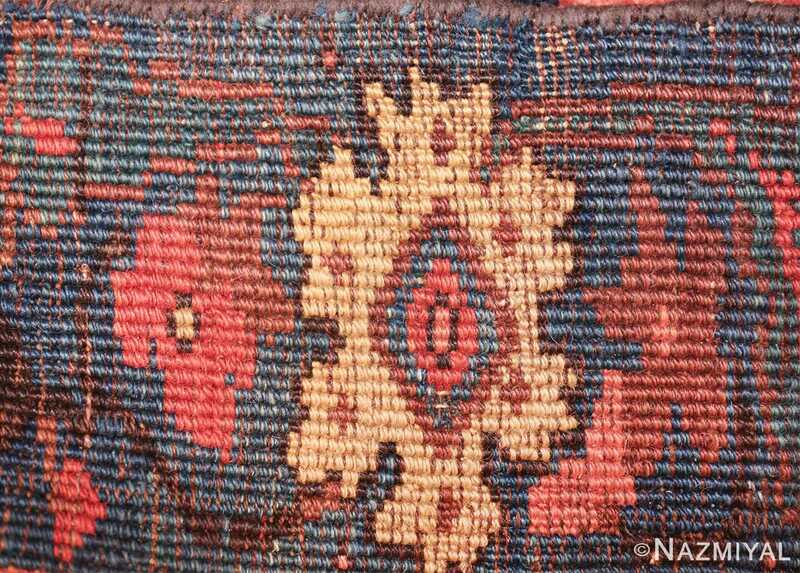 The brilliant color play and patterns of this timeless masterpiece are skillfully woven together to both portray nature and obscure it in the most delightfully intriguing way. 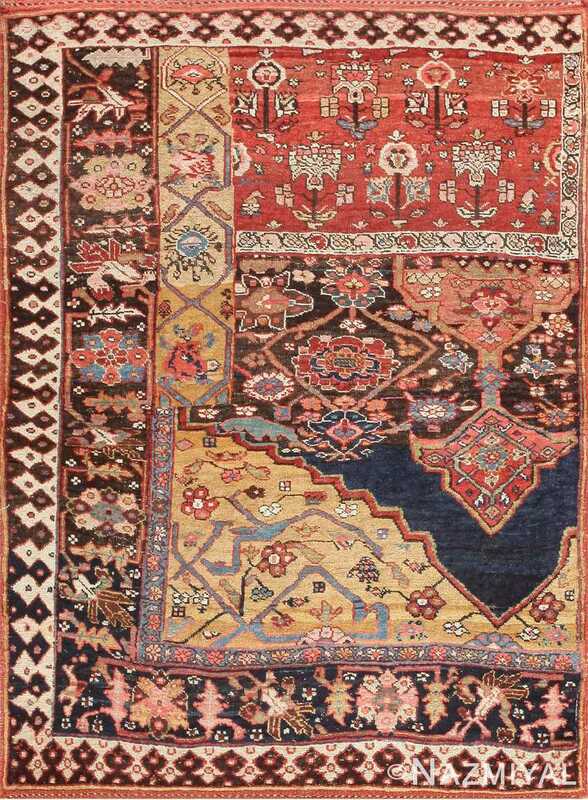 The distinctly clandestine charm of this antique Persian Bidjar sampler rug will add a special beauty to any home’s interior design setting. 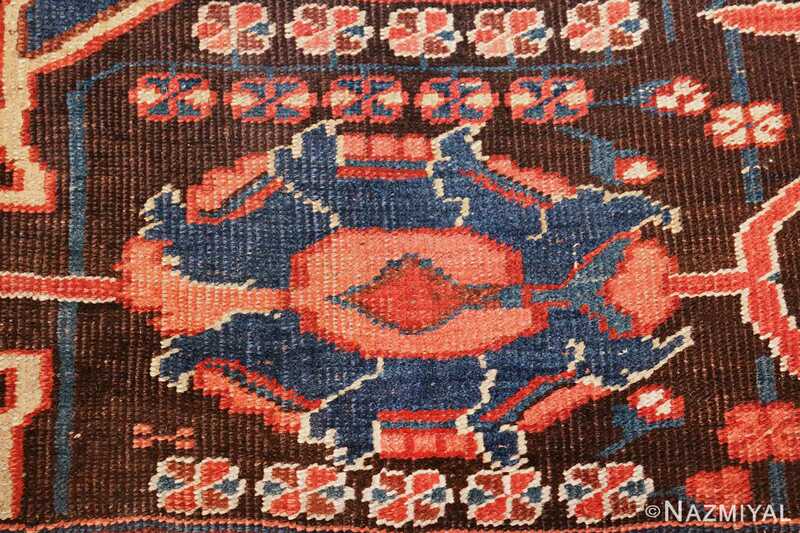 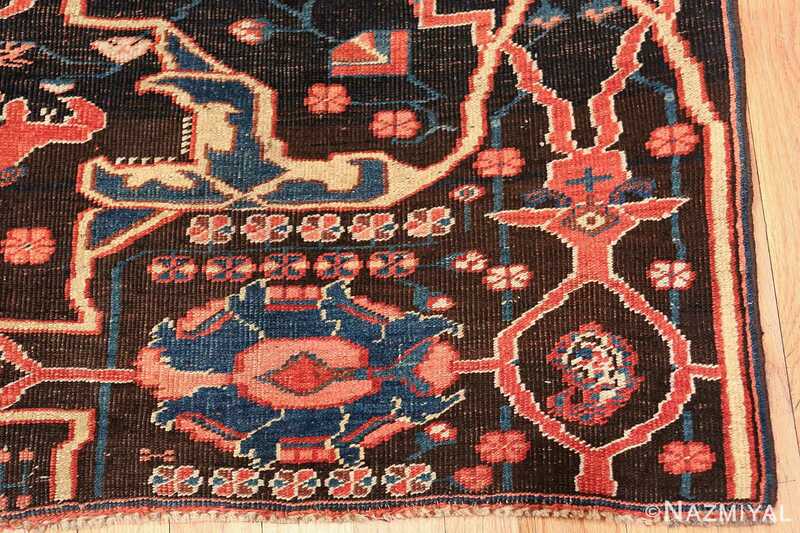 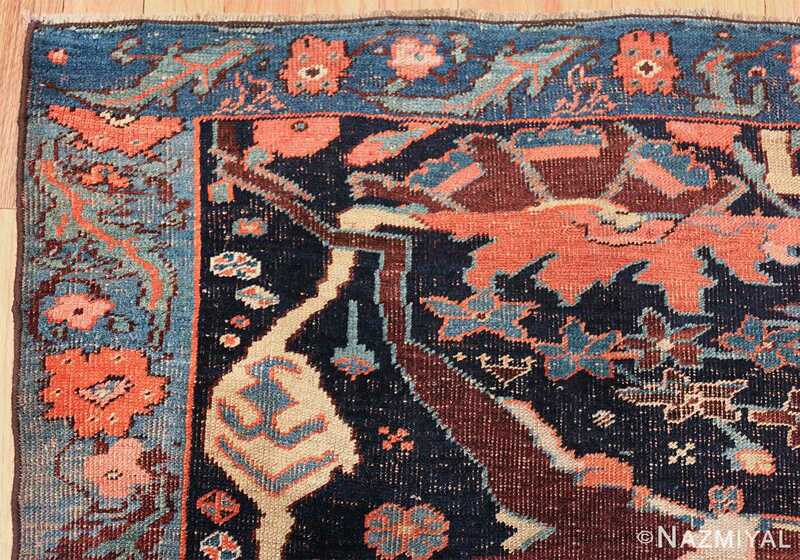 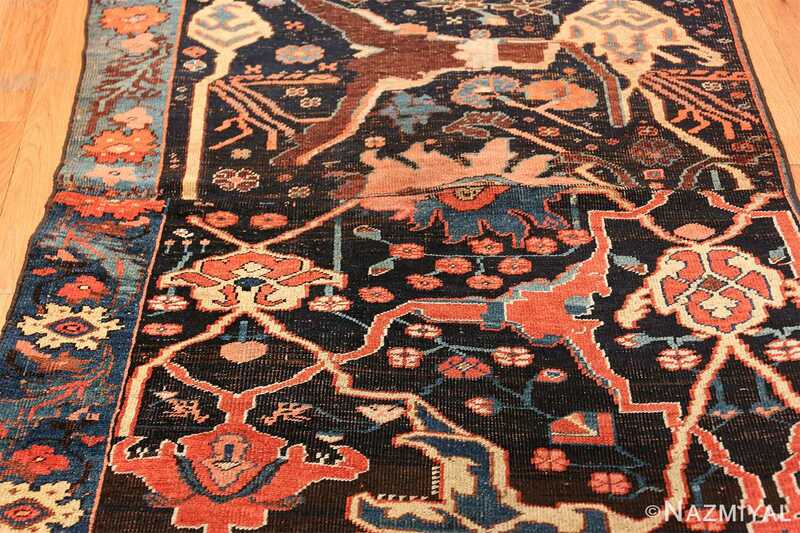 This highly collectible antique rug is more than just a Oriental rug. It is a beautiful and exciting historical relic of the past and a breathtaking artistic work of textile art.